Quentin Tarantino's Kill Bill is a definitively post-VCR film, a movie that liberally quotes from and alludes to many other works from the rich tradition of the cinema. But is it a loving postmodern tribute or outright celluloid larceny? Kill Bill makes no secret of the fact that this is a film that is informed by much of what has gone before: the director's use of the Shawscope logo as an opening gambit states flat out that what you will see has at least been influenced by the works of that biggest of Hong Kong studios. But the reflections from the past hardly stop with the opening shot, as Tarantino takes bits and pieces from the cinematic canon and tosses them into the swirling mix. During the 90-minute run time of Kill Bill, you might notice echoes of Hannie Caulder, Lady Snowblood, They Call Her One Eye, War of the Gargantuas, Modesty Blaise, Black Sunday, Five Deadly Venoms and many more. The mélange is so pervasive that a film that Tarantino claims to never have seen -- Francois Truffaut's The Bride Wore Black -- has been extensively cited by reviewers for its resemblance to this final product. In its way, then, Kill Bill is more or less a cinematic assemblage of fragments that cohere to make a whole film -- though in reality they will eventually make two films, which in itself is somewhat telling. Tarantino has quite obviously styled this film in a manner that allows him to model bits and pieces of the movies that he loves from the past and to synthesize them into a brand new work. The movie stands as a true evocation of what film has become in the period that follows the advent of the home videocassette player: for without the cultural effects produced by that technological marvel a wildly postmodern piece such as this one may never have come to fruition. The influence of the late 20th century's technologies on the cosmopolitanism of film audiences cannot be overstated, as first television and later the VCR made widely available many works that previously could only previously be viewed in spotty fashion by those who lived in areas with a thriving repertory film circuit. Today, the rapid expansion of globalizing trends and the appearance of the Internet have only exacerbated this effect for film fans, but there's no denying that the marketing of a home player was the truly watershed event for cinemaphiles. This device made it possible for film lovers to take the initiative in seeking out material from a wide body of work, allowing for an control over individual viewing that was much more difficult before the 1980s. This new access to accumulated tradition for viewers was to have many effects on the cinema, of which some would be salutary and others deleterious. But there's no question that among a certain core audience of cult film lovers the invention would act as an open gateway to the viewing of a multiplicity of movies, including such diverse areas as spaghetti westerns, monster movies, martial arts epics, and exotica of all kinds. With the doors to whole new worlds thrown open wide by this new invention, it was only a matter of time before the new ability to view movies from all over in the comfort of home began to show its own influence in the cinema that plays at the megaplex. The effects of the VCR on post-1980 cinema are many and varied, and it is hardly in Tarantino's oeuvre alone that the invisible influence of videotape can be seen. But it's also no surprise to find that the director toiled as a clerk in a video store during some of his formative years, and all of his work contains referential asides that make it patently obvious that his style has been heavily influenced by what he has seen. In fact, this filmmaker's corpus is filtered so much through the lens of other movies that one has to wonder about the fine line between tribute and theft, homage and ripoff, reverential obeisance and cultural appropriation. In many ways, these films of Quentin Tarantino are but celluloid pastiche, reflections of pieces of other work refracted through the camera again to appear in a whole new form. Perhaps, if the late Donald Barthelme was correct, this is simply the essence of art in the modern world -- where the ultimate apotheosis is collage and fragments are the only truly trustworthy form. While the tendency towards allusion and cinematic reworking shows up in all of Tarantino's films, it is nowhere more manifest than in Kill Bill. Its debt to the films of the Shaw Brothers is completely overt, from the aforementioned intro shot right on through the climactic battle between Uma Thurman and Lucy Liu that takes place on a set that is quite consciously modeled after the Shaw's atmospheric style of design (and, more specifically, after the big fight from the studio's Chinese Boxer). The idea of the Deadly Viper Assassination Squad also appears to be a take on The Venoms, a crew of martial arts actors who worked for the Shaws during their heyday. Additionally, the nods to that great Hong Kong outfit are not necessarily visual in form, as the musical theme from Master of the Flying Guillotine is used as a cue during the running of Kill Bill. (Aside: this bit is not Chinese in origin, as it is actually "Super 16" by the German kraut rockers Neu). But the cultural detritus being picked over in Kill Bill is certainly not limited to the films of the Shaw Brothers. Tarantino's cinematic archaeology pulls shards from varying times and locations, citing references from both television and motion pictures. Here is a bit that seems inspired by Fukasaku's Black Lizard; over there is something that seems to echo Suzuki's Branded to Kill; here again are the tattered sonic shreds of The Green Hornet and Ironside. Production IG, one of Japan's most historic producers of animation, did the anime sequences. 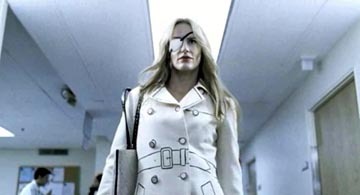 Uma Thurman's outfit is undoubtedly meant to reference the great Bruce Lee's signature fashion suit, and Daryl Hannah's eye patch is straight off of Christina Lindberg. Tarantino also does better than simply citing past work, however, as he is even good enough to give jobs to actors such as Sonny Chiba, Gordon Liu and Kenji Ohba, all of who have been involved with classic Asian films in the past. There are in fact so many moments that are suggestive of other films in Kill Bill that it's a bit of a fool's errand to attempt to catalogue them all. So let's allow the spaghetti western and eurocult nods to lie fallow and instead take on a bit of blaxploitation, which seems to be the most controversial of Tarantino's appropriations. There has been some press on how the part of Vivica Fox (whose housewife screen name -- Jeannie Bell -- is identical to a wonderful star of these self-same movies) is an example of the way that the director has stolen the form of the low-budget black films of the '70s without understanding or expressing their true essence. This is more or less a variation on the theme of a very old argument, as it seems to me to be essentially a rehash of the 1960s fight over rock and rollers using the blues as the basis for songs and making far more money than the black originators of the music. When the Rolling Stones covered Howling Wolf, Bo Diddley, Willie Dixon and Muddy Waters during the hippy years, were they in fact exploiting these musicians or simply creating their own variation of songs they loved? Is it possible for white artists to do their own versions of art that arose out of a black culture, make money off it, and not be accused of calculating racial profiteering? Would it be better for mainstream artists to not make this sort of appropriation at all, or is the trade off of wider recognition in the marketplace for the pioneers of the art worth the resultant thievery by the dominant culture? I suspect that the viewer's feelings on Tarantino's borrowing from blaxploitation will of necessity be filtered through a prism of class and market politics, with some accepting his use of the form as simply a quite heartfelt tribute to material the director loves and others decrying it as a blatant ripoff of authenticity that results in nothing more than ersatz crap. Whether or not there exist easy answers to the many questions that Tarantino's directorial style poses, the fact remains that Kill Bill is utterly representative of the zeitgeist of the current era. Exemplifying the dislocations of time and place that our technological devices have thrust upon us, the film profusely regurgitates previous culture with 24 times a second's worth of flashy visuals and sonic cues. This movie is nothing if not a post-VCR document, a work that cannot possibly have existed in a world before viewers could reach across the globe and pluck whatever product they wished to view from a teeming international market of near boundless choice. By taking the varied influences from his past and weaving them together into a whole new form, Tarantino has managed here to create on celluloid a work of art that exists not just as exploitation but as meta-exploitation. Kill Bill may be just an over-the-top testimonial from a devoted fan now behind the camera, or perhaps it is instead rapacious cultural piracy of the highest order. Final assessment on this point must of necessity lie directly with the viewer, and this bit of truth only serves to underline the tumultuous postmodernism that Tarantino's new megaplex film typifies. Speaking only for myself, I can't hardly wait for Part Two.